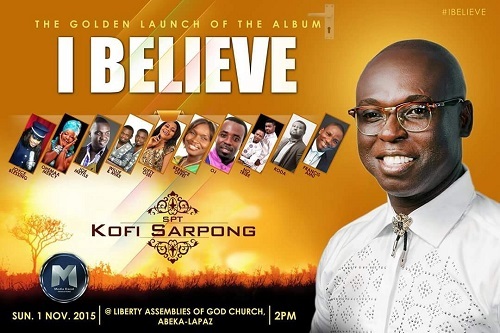 SP Kofi Sarpong will be joined by a host of finest Ghanaian gospel artistes on Sunday, November 1, as he launches his latest album, I Believe at the Liberty Assemblies of God Church in Abeka Lapaz, Accra. This album is the third from the police officer since he hit the limelight in 2010. The others are Sacrifice and Saviour. Some of the artistes lined up to support SP Sarpong at the launch which will be preceded by a Red Carpet segment are Ohemaa Mercy, Joyce Blessing, Joe Mettle, OJ, among others. Apart from those in the gospel fraternity, the management company handling affairs of the gospel artiste, Media Excel, told Showbiz some notable personalities such as the former skipper of the Black Stars, Stephen Appiah would grace the launch. “Gasmilla, Becca, Samini and a host of others will be present to give their ‘senior brother’ support on this special day,” Mr. Kwesi Ennin, CEO of Media Excel said. The album which is already available on digital platforms for downloads such as Deezer, Amazon and Itunes features Joyce Blessing and Jack Alolome. “This new album seeks to inspire Christians and people from all walks of life to appreciate the work of God and to believe in the saving power of God in times of difficulties,” SP Sarpong said in an interview with Showbiz recently. “Nothing good comes on a silver platter and the target for this album isn’t just for Ghana but the whole of Africa so we needed the best hands to work on it. It is not surprising that Hour By This Time, one of the songs on the album is already making waves,” SP Sarpong said. The 11 – track album which has songs such as “Afutusem”, “Woye Nyame” and ‘Hour By This Time’ has some of the country’s finest sound engineers like Nacy, Dave Joy, Shadrack Yawson, Daniel Bassey and Kumasi based Collinstee work on the production and instrumentation.